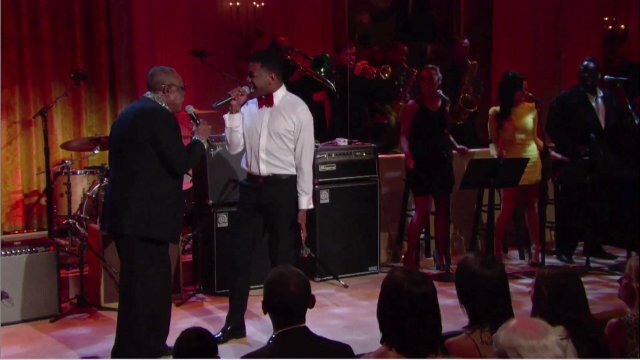 “In Performance at the White House: Memphis Soul” is a PBS music special taped in the East Room of the White House, celebrating the timeless classics of Memphis Soul. President and Mrs. Obama will host the event. The all-star concert will include performances by Alabama Shakes, William Bell, Eddie Floyd, Steve Cropper, Ben Harper, Queen Latifah, Cyndi Lauper, Joshua Ledet, Sam Moore, Charlie Musselwhite, Mavis Staples and Justin Timberlake, with Booker T. Jones as music director and band leader. Meet the artist of "In Performace at the White House: Memphis Soul"
Find out what songs will be performed at "In Performance at the White House: Memphis Soul"
"In Performance at the White House: Memphis Soul" is a production of WETA Washington, D.C., in association with AEG Ehrlich Ventures, The GRAMMY Museum and the National Black Programming Consortium (NBPC). The executive producers are Dalton Delan and David S. Thompson for WETA; and Ken Ehrlich, executive producer of The GRAMMY Awards, and Robert Santelli, executive director of The GRAMMY Museum, for AEG Ehrlich Ventures. The producer is Renato Basile. The music director is Booker T. Jones. The "In Performance at the White House" series was created by WETA Washington, D.C. The series producer is Jackson Frost. Corporate funding for the program is provided by Pepsi-Cola. Foundation support is provided by The Annenberg Foundation and the Anne Ray Charitable Trust. Major funding is also provided by the Corporation for Public Broadcasting, PBS and public television viewers.